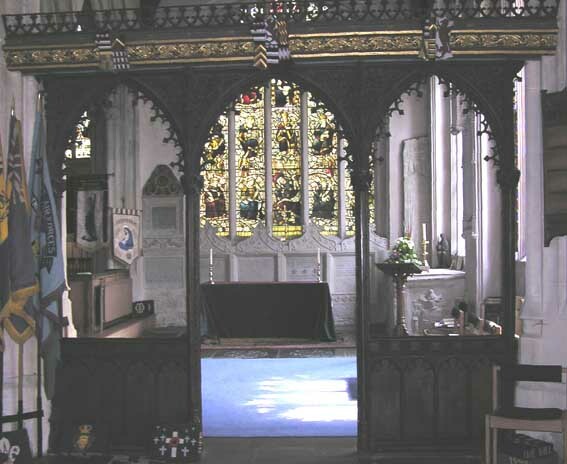 Dating from the fourteenth century, the Lady Chapel, formerly known as the South Chancel Chapel or the Hungerford Chapel, is entered through a screen with three Hungerford coats of arms on the west side. This screen was built from timbers taken from the ancient roofs of the church and is a memorial to Canon Rich who was Vicar at the time of the major late 19th century rebuilding programme. In the south wall of the Lady Chapel the westernmost window contains small panes of painted glass showing two heraldic devices of the Hungerfords – intertwined sickles and a raven gorged (collared) with a coronet and chained. Below the south window is the stone bench which would have originally been the only form of seating in the church. Benches like this were provided against the walls of churches for the aged and infirm – everyone else stood – and gave rise to the phrase “the weakest go to the wall”. In the south-east angle of the Lady chapel is the large Baynton tomb. Above, against the east wall, is half of a sepulchral slab. This looks like the front of a mummy case and is carved with a life-sized female figure with hands linked in prayer. This was dug up from the floor of the chancel in 1847 after the removal of the vicarage pew. Its inscription in Norman French – and now, unfortunately, virtually indecipherable – refers to “… Clerk, and his wife Alis, founders of a chantry”. There was a John Clerk recorded as a considerable landowner in the the reign of Edward III and it is possible that the slab refers to him and his wife and that they were the founders of the old chantry chapel of St. Andrew. Note, too, the memorial tablets (2-7) behind the altar. On the floor are two dark ledger stones which were removed from the north chancel chapel and commemorate two local families with the name Long. The most famous member of those families was Sir James Long of nearby Draycot Cerne who was a staunch and active Royalist in the Civil War. The east window is a Jesse window of 1900, by Lavers and Westlake, said to be comparable with the famous one in Dorchester, Oxfordshire. It depicts the genealogy of Christ from the “root of Jesse”, father of King David (Matthew 1 in the New Testament), shown as the branches of a vine. Nowadays the Lady Chapel is used for certain weekday services and during Holy Week – the week before Easter.